Today started off a lot more relaxed than yesterday, because, well, we didn’t have a flight we had to attend. The breakfast at the hotel is great, they have a buffet and they have gluten-free options for corn flakes and they have gluten-free bread. For today I just had two slices of bread, one with jam and one with camembert and a bowl of peach yogurt with gluten-free corn flakes. They also have a juice bar where you can get fresh orange juice, apple juice, peach juice and ‚detox water‘ they call it. It’s basically water with slices of lime, slices of cucumber and a few mint leaves in it and ice cubes you can add if you want. After visiting the Houses of Parliament, something my grandma really wanted to do, the search for food continued. 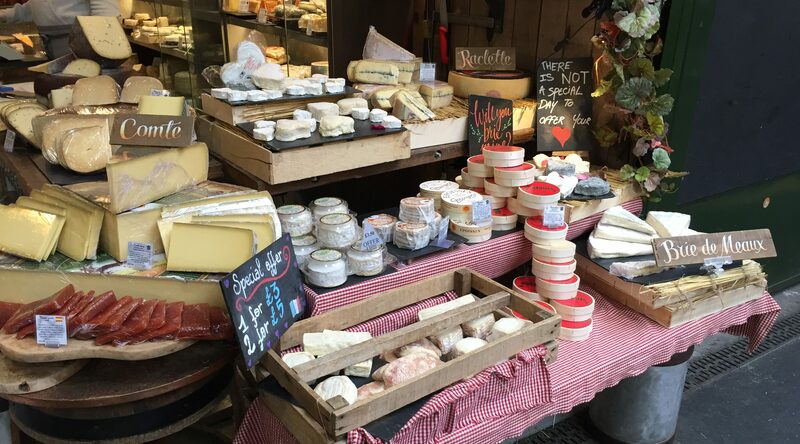 The Borough Market is one of London’s most well-known food markets. And it’s great. Can’t put it any other way. 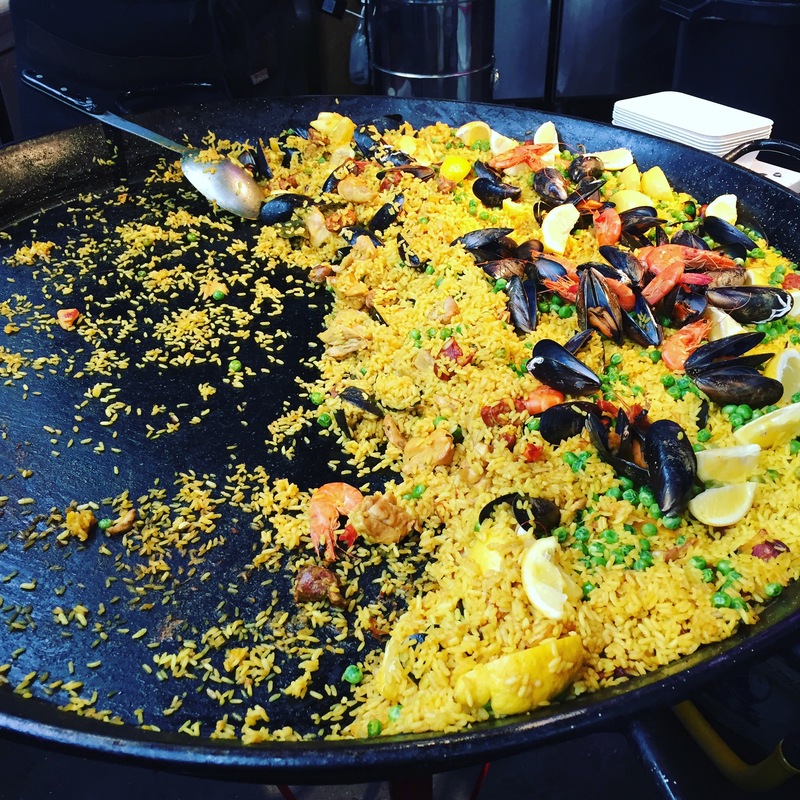 Cheese, bread, pastry, fish, seafood, fruits, vegetables, chocolate, jam, chutney, spices, cereal, Turkish delight… You name it, they have it. 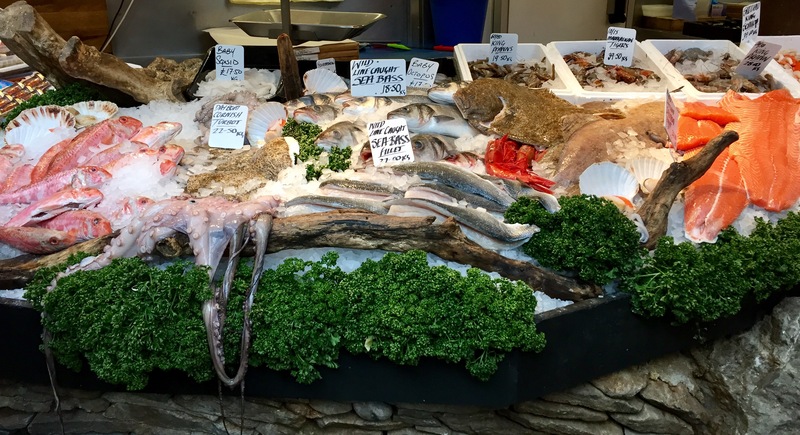 But the best thing about that market, in my opinion, are all the booths where you can get food to eat right there. There is German, English, Indian, Turkish food, Argentinian, South African and Asian cuisine. There is vegetarian food, vegan food, the possibilities are sheer endless. 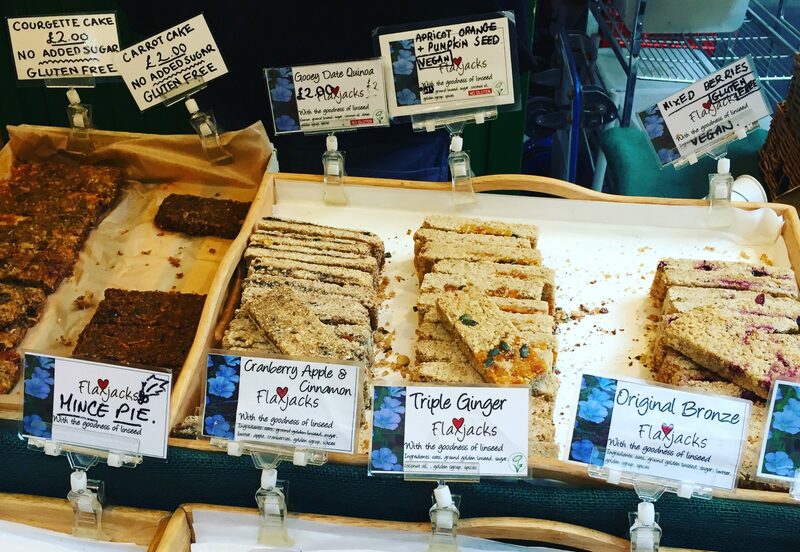 I bought a carrot cake bar from ‚Flaxjacks‘ for £ 2. They have a lot of gluten-free options and when you tell them your allergies they can tell you which ones are safe to eat. They also don’t contain any additional sugar, but are still very sweet. I also bought Turkish delights, because I’ve been craving it for about two years now, and you can’t really get it in Germany. 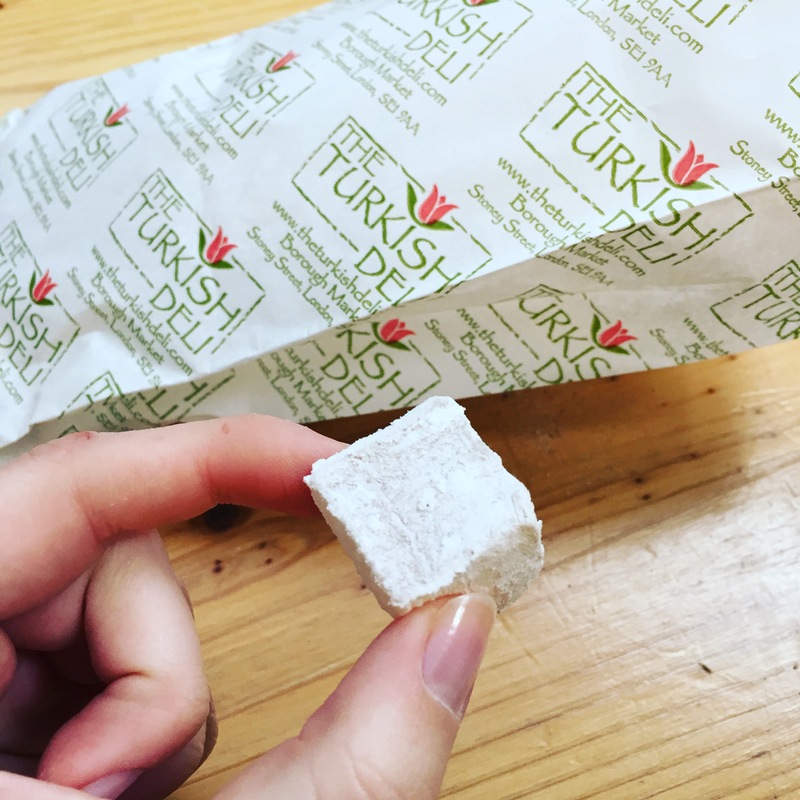 What they call Turkish delight in Germany is in no way related to the Turkish delight you can get here. They have many different flavors, such as rose, pecan-maple syrup, pistachio, Turkish coffee, lemon, etc. but my favorite is the cardamom one. They are all gluten-free, they contain no additional or artificial flavors, no Gelatine and they are suitable for vegans, vegetarians and Halal. 200g cost £ 5. 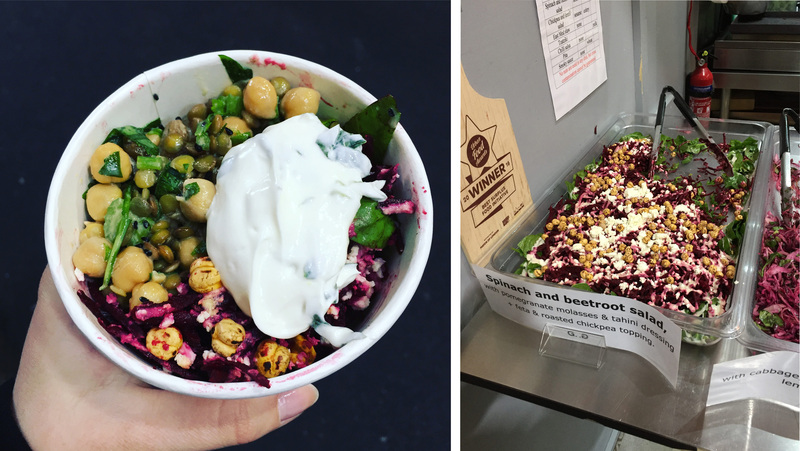 At a booth called the ‚Gourmet Goat‘ my grandma and I shared a bowl of chickpea-salad for £ 3.50. 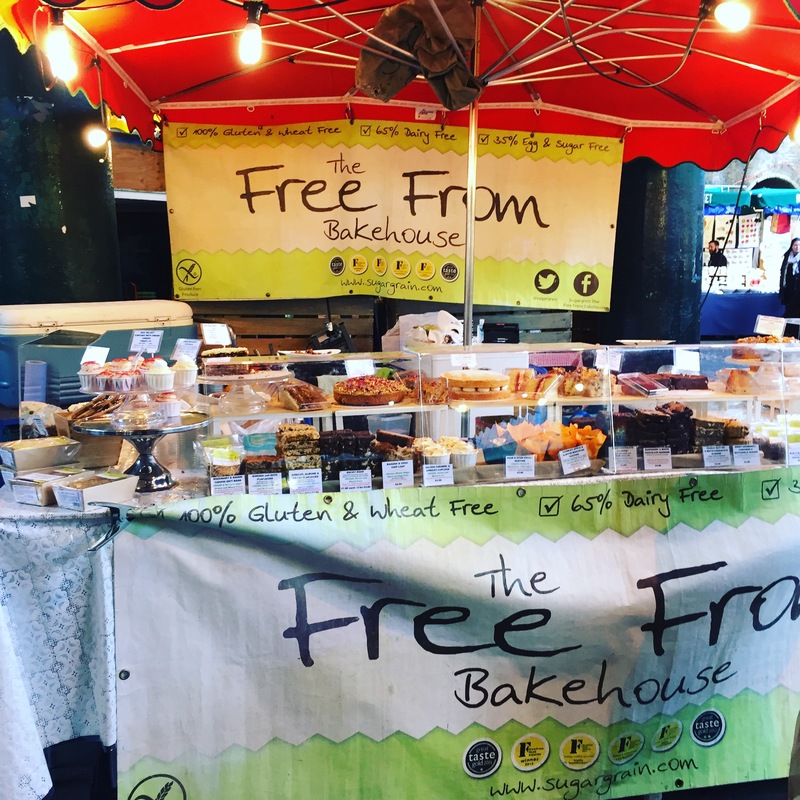 There was this booth called ‚The Free From Bakehouse‚ and they sell only gluten-free food. Additionally 65% of the stuff they have is also dairy free and 35% sugar free. Today was definitely better day than yesterday and not just considering the food. But mainly considering the food.